The arena has a total of 117,000 square feet of exhibition space, and is suited to handle stage events ranging from an intimate concert bowl with seating for 4,000 to a full-scale entertainment event for 18,500 people. All seating and stage set-ups are flexible and can be adapted to meet various capacity requirements. FirstOntario Centre varies dramatically in setting, from an ice rink to a basketball court to multi-level concert stages or a dirt-based surface for motor events. The venue is also a great venue to host award shows and large consumer trade shows, and is available for both still photo and video filming. A street level ramp provides direct vehicle access to the arena and exhibition hall level. Move-in and move-out times are greatly reduced as there are four loading bays available, and media facilities (including a TV studio), dressing/locker rooms and a First Aid room are also located on this floor. Full catering services are available on site. Additionally, the ice at FirstOntario Centre is available for rental by the hour, and is often used for corporate and family events. Book any of these following events! 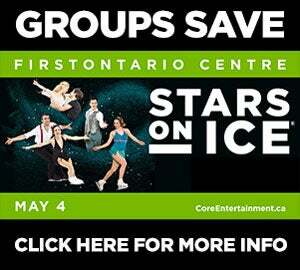 Core Entertainment offers an outstanding concert facility at the FirstOntario Centre arena. This venue can be personalized to meet the specific needs of an event, and is serviced by a dedicated team of staff who take pride in making each concert a unique experience. Broad access to major and diverse concert audiences at this venue ensures excellent attendance across a wide range of concert events, and spectacular sound quality guarantees a live music experience that exceeds all expectations. FirstOntario Centre is also available for a variety of live stage events, including theatrical and comedic performances, lectures and fashion shows. The setting within FirstOntario Centre can vary dramatically from ice to multi-level stages to dirt-based surfaces for motor vehicle shows. 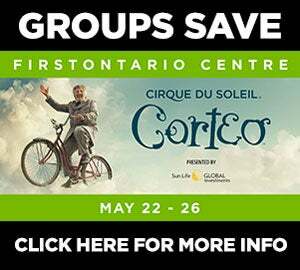 Past shows at FirstOntario Centre have included events by Disney on Ice, Monster Trucks, World Wrestling Entertainment (WWE), The Harlem Globetrotters and Cirque du Soleil. FirstOntario Centre also offers ideal space for large conventions and exhibits, with a total of 117,000 square feet of exhibition space available. Retractable seating allows for 87,000 square feet of event space on one level by combining a large arena surface with the adjacent Exhibition Hall. An additional 30,000 square feet of space is offered on the Concourse Level. A street level ramp provides direct vehicle access to the arena and Exhibition Hall level, and the availability of four loading bays greatly reduces move-in and move-out time for exhibitors. Media facilities (including a TV studio), dressing locker rooms and a first aid room are also located on this level. FirstOntario Centre also offers ideal space for large trade and consumer shows, with a total of 117,000 square feet of exhibition space available. Retractable seating allows for 87,000 square feet of event space on one level by combining a large arena surface with the adjacent Exhibition Hall. An additional 30,000 square feet of space is offered on the Concourse Level. A street level ramp provides direct vehicle access to the arena and Exhibition Hall level, and the availability of four loading bays greatly reduces move-in and move-out time for exhibitors. Media facilities (including a TV studio), dressing locker rooms and a First Aid room are also located on this level. Past consumer and trade show events at FirstOntario Centre have included several Food and Drink Festivals. Internationally recognized as a superior professional sports facility, FirstOntario Centre is also Hamilton’s premier venue for amateur sporting events. Its configuration can be easily adapted to suit diverse event requirements, from hockey or basketball games to gymnastics, and its world-class facilities are sure to please any crowd. The arena is available for rental to skating clubs, children’s and old-timer hockey leagues, various amateur athletic organizations and other sports groups. A true Hamilton landmark, FirstOntario Centre is home to OHL team The Hamilton Bulldogs and has been celebrated as one of the foremost professional sports facilities in North America. Most recently the Canadian Elite Basketball League has announced that FirstOntario Centre will be the home of the Hamilton Honey Badgers professional basketball team. The CEBL will sun a sprin/summer schedule out of FirstOntairo Centre as Core Entertainment's newest tenant. FirstOntario Centre offers unparalleled service to clients and patrons, and is conveniently located in the heart of downtown Hamilton among restaurants, coffee shops and public parking facilities. The venue is incredibly adaptable and can host a variety of professional sports events, including basketball, tennis, martial arts and all ice sports.The venue features some of the best ice in Canada as well as comfortable stands and excellent change facilities. Members of the public are welcome to rent the ice at FirstOntario Centre for corporate functions, family events, skate performances and ice sports of all kinds. Whether it’s a game of pick-up or a skate party, FirstOntario Centre offers the perfect setting for a fun, unique event that your guests will remember. Combine business with pleasure by inviting corporate clients and their families for an afternoon on the ice, or bring the entire family together for a fresh take on the family reunion. Your child’s hockey team will feel like pros after a game at FirstOntario Centre, and there’s no better way to foster team-building among co-workers than with a staff party at the rink. A professional-grade rink that has hosted some of the world’s best hockey players and ice skaters, FirstOntario Centre takes your on-ice event to the next level. Ice rentals include the use of FirstOntario Centre’s first-class facilities, including change rooms and an off-ice party area.